To be constructed on the site of the 1970’s office development known as Oisin House, itself constructed on the site of the former Queen’s Theatre. 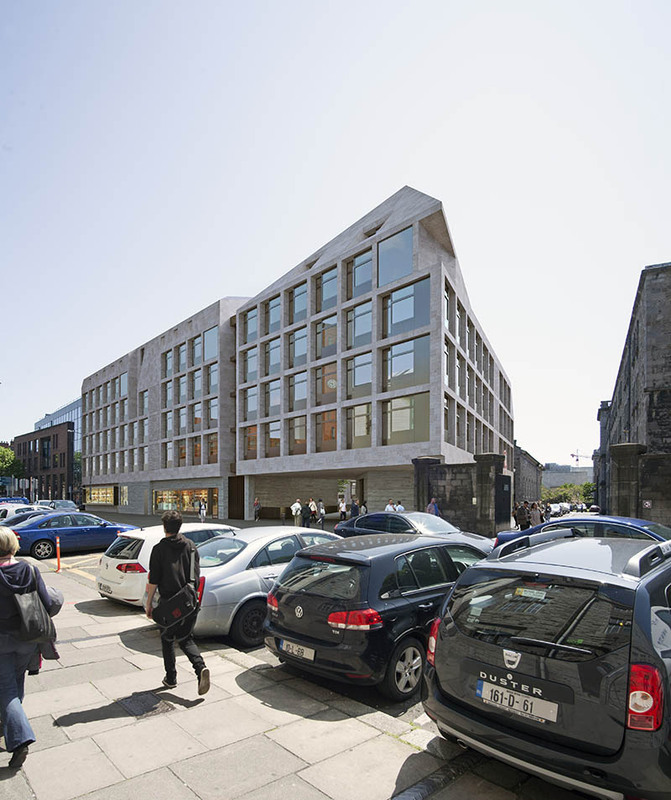 Printing House Square will be built on Pearse Street to provide 250 student rooms over a Health and Sports Centre for Trinity College. The project is bedded in its Dublin location– yet is a contemporary interpretation of that environment, working to make a new vernacular for the city. 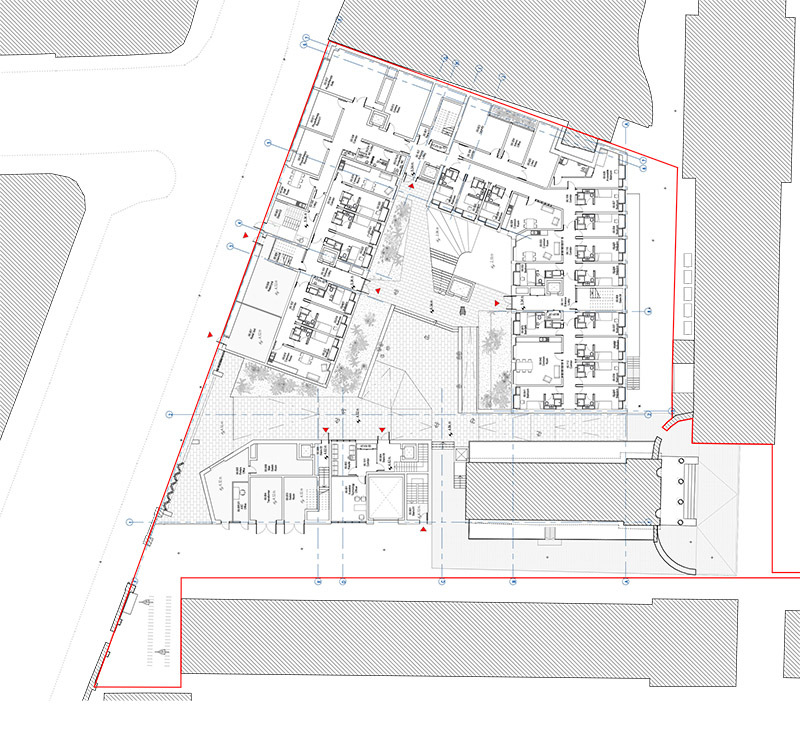 The courtyard plan can be seen as a strategic extension to the sequence of Trinity squares, yet it also acts as a public city square and will serve as a public gateway between the College and the city, bringing increased life to this relatively dead section of Pearse Street. The form is like a granite rock with an undulating stone roof folded and shaped, reflecting the mountains in distant view to the South and, at close quarters a grouping of ordinary Georgian roofs glimpsed in the city. It feels like a solid mass externally excavated and penetrated by opes, routes and ways through. Its materiality reflects its form and location-­‐ a boardmarked concrete working plinth supporting a granite upper world-­‐ which descends to ground floor to encase it externally, revealing the concrete core at key moments. The site is at several junctions -­‐ the beginning of Pearse Street opening towards Grand Canal Dock, the junction of Trinity and the wider city; the building respond to both environments and bridges between them. It also establishes a strong formal and material relationship between contemporary architecture and the surrounding historic fabric, in particular, the character of the old Printing House within the College boundary. 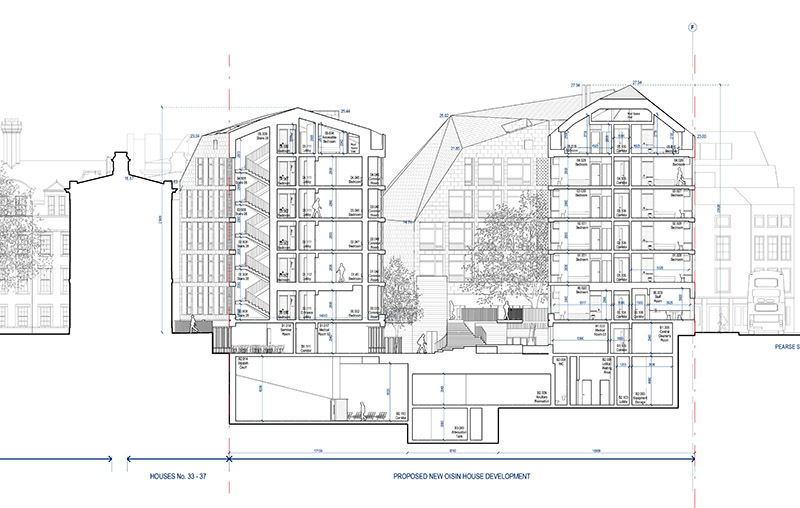 The architecture folds down to provide a more intimate context around the Printing House; adjacent gables do not have windows; they will be moulded planes setting its Classical temple architecture in a rocky landscape setting, allowing it to retain precedence in the view from New Square and the steps of the Berkeley Library.